Years ago, my family was spending Thanksgiving at our dear friend, Judy’s house. One of the appetizers she served were these fabulous pineapple-filled dates wrapped in turkey bacon. I remember eating one and thinking, “Where have these been all my life?” These simple and super tasty hors d’oeuvres have become one of my go-to recipes on many occasions. 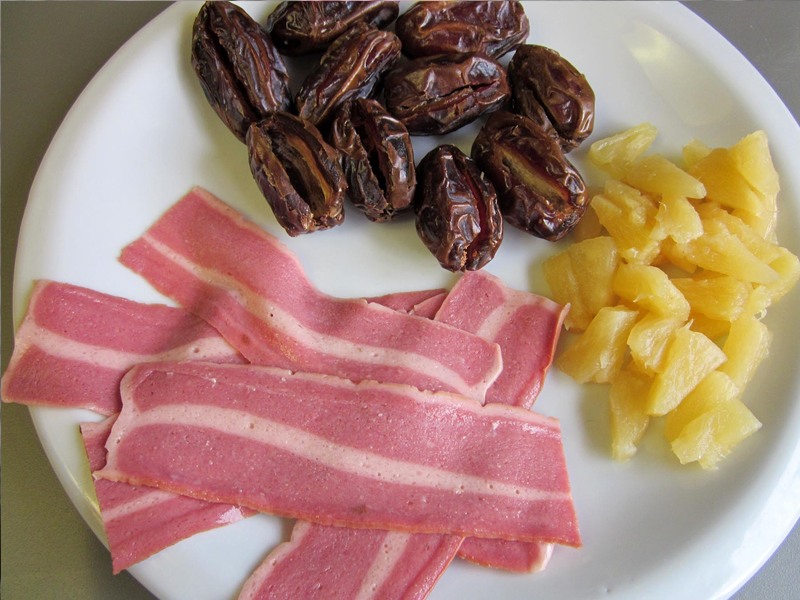 Something about pigs and blankets… whether the pig is wrapped up, or the wrapping is done by a pig (sometimes salami or bacon)… it’s interesting that pork is commonly involved in the bundle somewhere. I wonder why? *scratches head* I did not consciously spare the pig by using turkey bacon, that is simply the way I tried them first, so I prefer them that way. You could most certainly use pork bacon. You could even use a veggie bacon, such as MorningStar. However you choose to wrap them, they won’t last long at your next party! Dates filled with pineapple and wrapped in bacon. 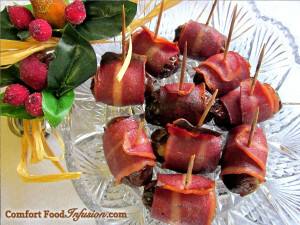 This super simple and tasty hors d-oeurve is always a hit. Makes 24 pieces. Cut a slit down each date and remove pit. Fill each date with a slice of pineapple. 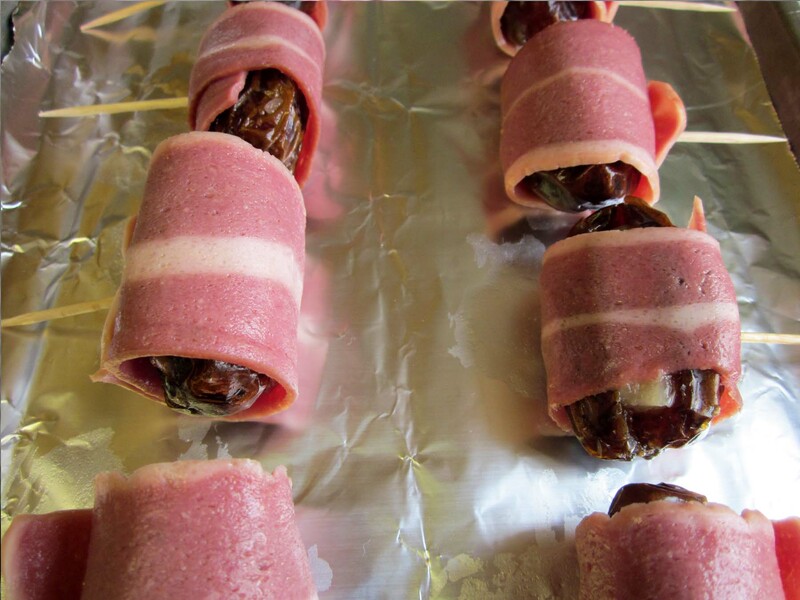 Wrap each date with a half piece of bacon, and secure with a toothpick. Arrange on a cookie sheet with toothpick laying on it's side, as you will need to flip them while broiling. Broil about 8 inches away from flame, for about 4-6 minutes, or until the bacon begins to brown and crisp. Flip over the dates so they cook on the flip side. Broil second side for about 4-6 minutes. Remove from oven and transfer to serving plate. *If you use canned pineapple 'chunks', slice each chunk in half in order to fit inside date. If you use canned 'tidbits', you probably need to use two tidbits per date. **You can use turkey, pork, or even veggie bacon. 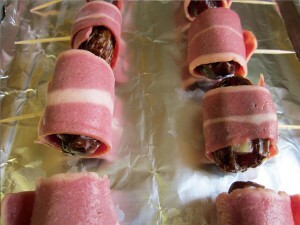 Don't use a whole strip, as they will wrap to be too thick and not cook thoroughly.